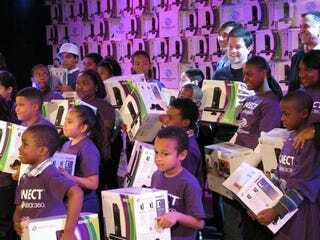 Actor Mark Wahlberg teams up with Microsoft today to help deliver a funky bunch of Xbox 360 and Kinect gaming hardware to thousands of Boys & girls Clubs across the nation. The Boys & Girls Clubs of America have been helping underprivileged children become productive, caring, and responsible adults for more than 100 years. Today the clubs number close to 4,000, and serve more than four million young people across the country. Mark Wahlberg was once one of those young people, and that's why he's teamed up with Microsoft to help bring 4GB Xbox 360 Kinect bundles to thousands of clubs nationwide. "I've experienced firsthand the positive impact organizations like Boys & Girls Clubs have on the lives of young people," Wahlberg said. "When I heard Xbox 360 wanted to give Kinect to Clubs across the country, I had to jump in and help." The bundles will include the 4GB Xbox 360 console, a Kinect camera, and two games: Kinect Sports and Kinect Adventures. "The first time we saw Kinect, we knew it would have a special ability to bring kids, their families and mentors together. This is gaming and entertainment that encourages teamwork, fair play and creativity," said Cyndi Court, executive vice president of Boys & Girls Clubs of America. "We're so excited to provide Kinect for Xbox 360 to our local Clubs, and are thankful to Mark Wahlberg and Xbox for supporting our mission to keep kids healthy and active."